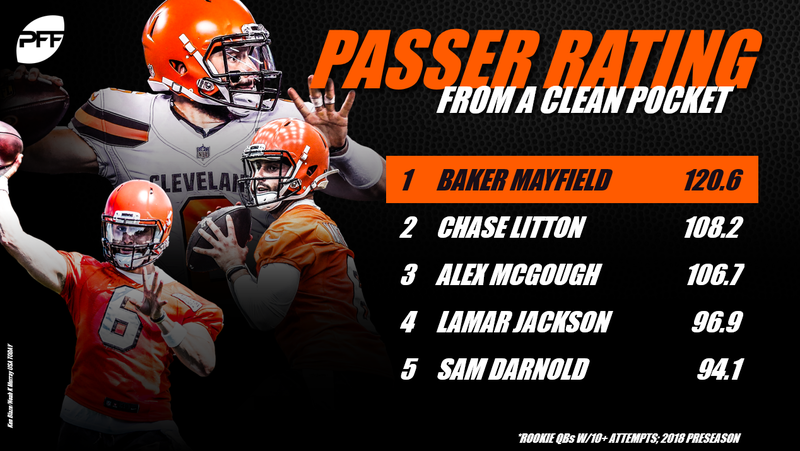 With Cleveland Browns QB Baker Mayfield grading out as PFF’s highest-graded rookie quarterback through the first three weeks of the preseason after being the No. 1 player on our Draft Board all spring, one might think this will be a ‘we told you so’ article. In fact, it’s the opposite of sorts (we still told you so though). One of the criticisms I had of the Oklahoma product during draft season was his pocket presence. Playing behind a Sooners line that was one of the best in the country, Mayfield had a propensity to hold the ball too long, bail out of clean pockets and create his own pressure. Through the first three weeks of preseason, he’s arguably had the most impressive pocket presence of any of the rookie quarterbacks. It represents a demonstrative step forward and is one of the key qualifiers at the quarterback position in the NFL. When I say ‘pocket presence’ there’s a number of factors that the phrase entails. An offensive lineman can’t adjust where he’s pass protecting on the fly as a quarterback moves in the pocket. Not hitting your landmark, drifting in the pocket and holding the ball too long can lead to unnecessary pressure like you see below. On this play, Mayfield is guilty of all three cardinal sins. He lands a yard off the hash, drifts aimlessly backward and holds onto the ball forever. Carelessness like that will get you killed in the NFL. It was one of the 11 sacks last year that were charged to the Oklahoma quarterback (to go along with two hits and eight other hurries). For a player that was only sacked 26 times all year, that’s a ridiculously high rate. So far on 56 dropbacks this preseason though, Mayfield hasn’t been charged with a single pressure. The play below is similar to the one above in that Mayfield has to come off his first read. The difference is that he hits right on the hash between 7-8 yards deep and his initial reaction to that is to move slightly forward in the pocket. This alters the course of the left defensive end back towards the line of scrimmage. If he were to try and back out, he’d be going against the right tackles leverage and inviting the defender into his lap. While that’s an impressive improvement, it’s only part of the equation. The next two factors are just as important. NFL pockets are much tighter and close much quicker than those most quarterbacks — and especially Mayfield — find in college. Though Mayfield has always been good at keeping his eyes up and making plays outside the pocket, he’s looked much better at manipulating and making plays from inside the pocket this preseason. He led the NCAA last year with a passer rating of 111.6 under pressure, but a lot of that was due to plays scrambling outside the pocket where his passer rating jumped to 127.9. Defensive ends are much faster at the professional level and it takes a special athlete to consistently rely on passes outside the framework of the offense. This isn’t to say Mayfield can’t do it at times, but it’s simply far more difficult in the NFL. That’s why it’s encouraging to see his first move continually be up in the pocket instead of out the back this preseason. The play below is an example of an ideal pocket presence. Mayfield immediately steps up in the face of pressure, keeps his eyes downfield and even though the pass isn’t great placement, it still results in a first down. While it may not be the sexiest thing a quarterback can do, all the elite quarterbacks in the NFL are masters of pocket manipulation. A lot of quarterbacks can look great against air, but not many can do it with 300-pounders breathing down their neck. Mayfield already looks like a different quarterback in the pocket than he did in 2017, and that’s a terrific sign for the Browns and their No. 1 pick moving forward.